A homeowner has numerous tedious chores to attend to in spring and fall. One of them is cleaning the gutters. If you have a pine tree nearby the needles get into your gutter system and clog it and can really plug up the downspouts. Precarious ladders and mechanical removal are the resulting steps to clear this very important drainage feature. Modern gutter systems claim to prevent needles from entering the gutter channels and promise that they will never have to be cleaned again. Some work and some don't. Let's investigate some that do. This product is a seamless piece of 1/4 inch aluminum with a stainless-steel micro-mesh on the top. The mesh is so tiny that no organic matter can get in. The holes are the size of a pin prick, letting water in but no needles. The mesh will collect debris on top and the manufacturers admit this. They recommend annual or biannual cleaning with a brush to remove the debris. The inside will remain clean and needs no special maintenance. 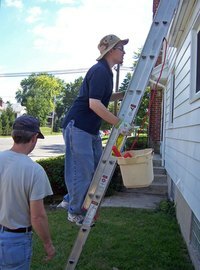 A brush can be attached to a telescopic arm and prevent dangerous ladder use. There are many other screen guards but Gutterglove has the finest mesh. Gutter foam fills the gutter with a water permeable foam insert. The foam comes in different dimensions and can fit most gutters. It repels seeds and leaves but pine needles can stick in it, requiring manual removal. It does keep the pine needles from flowing down to the downspout but the black color will attract heat and degrade the foam over time. The products offers a five-year guarantee; after that, you are back to the drawing board. These are essentially metal or plastic caps for the gutter with a tiny space for water to flow into. The systems are more expensive than gutter screens and their effectiveness depends on the manufacturer. Some provide a curved edge with a lip for the water to flow into and needles can get caught on the lip. Otherwise, the needles will find a way into the gutter, necessitating removal of the covers and manual cleaning. Most of the manufacturers promise maintenance-free gutters, but they still need annual cleanings. Hybrids systems are quite expensive. They utilize both a screen and a cover. They are more effective overall and reduce the downpour of water that can happen with screens that get clogged with needles. However, they are not fool proof and will require some maintenance, but not as much as other systems. The cover keeps most debris out of the mesh and the mesh will contain the rest of the organic matter. It cuts down greatly on the debris that sticks to the mesh.